57 photos of this important heritage centre. It is almost like an annex to the National Railway Museum. It has a wide variety of locos and rolling stock including pre-grouping carriages and wagons and early diesel shunters. Highlights include a listed LNWR station moved from Oxford, a North British 4-8-4 repatriated from South Africa, a Sentinel steam railcar repatriated from Egypt, a New York subway car body, and a Chieftain tank! Welcome to the Buckinghamshire Rly Centre! 28 December 2012. It is based at Quainton Road on what became the Metropolitan Rly's line from Baker Street through Aylesbury to Verney Junction, on the LNWR's Oxford - Bletchley line. In 1899 the Metropolitan granted the Great Central Rly running powers over its tracks from Quainton Road for its London extension from Annesley, Nottinghamshire, to its new terminus at Marylebone. Quainton Road was also the starting point of the private tramway to Brill. The tramway and the Metropolitan both became part of London Tranport when it was set up in 1933. The tramway closed in 1935, and the line to Verney Junction in 1956 The Great Central line closed in 1966 except for the Aylesbury - Calvert section, where a single track has been retained to serve a landfill site at Calvert. This line can be seen in the middle of this photo, which looks towards Calvert. 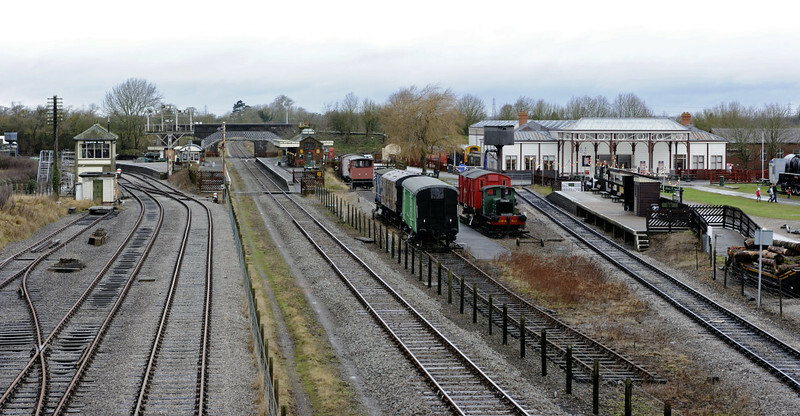 The Bucks Rly Centre has a visitor centre on the northern side of the Calvert line (right in this photo) and workshops and museum on the southern side, beyond the signalbox at left.